Confronted with increasing legal and social pressures, no tanner can afford the luxury of not being familiar with the main issues and principles of occupational, safety and health protection pertaining to tannery operations. Hydrogen sulphide gas present in tanneries and effluent treatment plants has proven fatal to workers exposed to it many times. The lessons that follow are to help tanners, tannery managers and operators to acquaint themselves with the basic principles How to deal with hydrogen sulphide gas. The on-line course developed by UNIDO including test provides an opportunity for the proper training within tanneries related to danger associated with hydrogen sulphide gas. After finishing the test with minimum score 80%, participants will receive the certificate and will be able to download it. 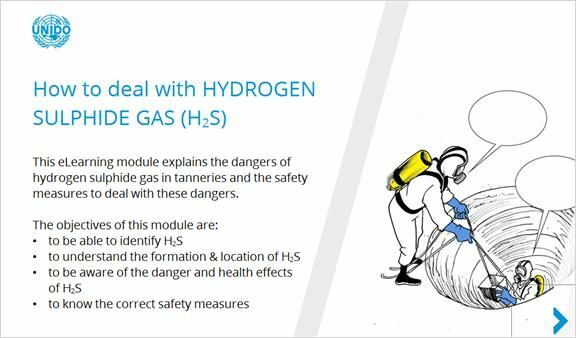 How to enrol into the UNIDO on-line course “ How to deal with hydrogen sulphide gas”? It is hoped that the certificate will be accepted also by Occupational Safety and Health Authorities as a proof that staff was properly trained.